The investment you’ll make in your Villa Park home is one of the biggest and most important that you’ll make in your life. So when you need any home improvement work done, you need a professional remodeling contractor that you know you can trust with the job. At Best Home Renovations, all of our remodeling contractors are licensed at extensively trained, so we can always guarantee your complete satisfaction with the work that we provide. We also endeavor to give you the best possible customer service, so we work with each of our clients directly on the design of every remodeling project we work on, accepting and encouraging your input. Even though we’re expert remodelers, you are the only expert there is when it comes to your home. Call us today with any questions you have about the services we provide, or to schedule your appointment, and we’ll be looking forward to starting your Villa Park remodeling project with you. One of the best and most popular ways to improve your home is to remodel your kitchen. A kitchen remodeling job can immediately raise the resale value of your home, and you’ll definitely notice the effects of this project. You use your kitchen every day to cook, clean, eat, and socialize, so a newly remodeled kitchen will change the way your entire home looks and feels. Your kitchen should be a comfortable, attractive, and easy to clean and keep clean part of your Villa Park home, and whether that means you need a few plumbing fixtures replaced, more counter space, or a complete overhaul of the room, our professionals can help. We’ll work with you to design your new kitchen, and we can guarantee your complete satisfaction with our work. You need the bathroom in your Villa Park home to be comfortable and relaxing, but thanks to common problems like a poor use of space, lack of ventilation, or old plumbing fixtures, they can become a major source of frustration. Our professionals can help you build your new bathroom from the ground up. Whether you want to completely gut and rebuild the room, or you’d like to keep some of the charm of your older bathroom while upgrading and enhancing its features, we’ll make sure it’s design and built exactly as you need it. 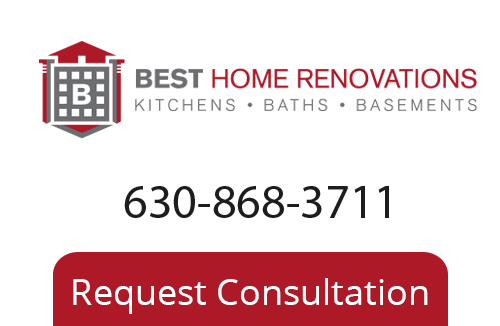 If you are looking for a home remodeling contractor in Villa Park or the surrounding areas, call Best Home Renovations at 630-868-3711, or fill out our online request form.